If you would like to join Troop 173 please attend one of our meetings. Although 21 Merit badges are required for Eagle, more than 100 are available. Boy Scouts may work on merit badges from the time they join a Scout troop until they turn 18 years old. There is no time limit for completion of merit badges other than age 18. 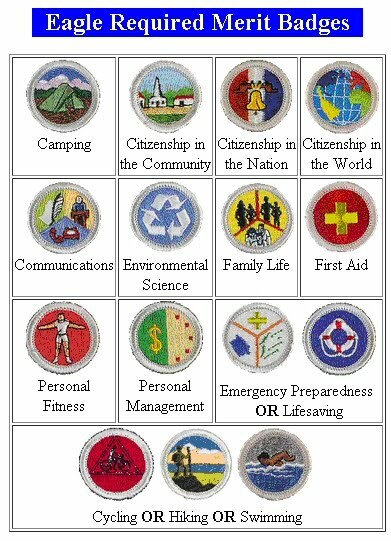 You can learn about sports, crafts, science, trades, business, and future careers as you earn these merit badges. Any Boy Scout may earn any merit badge at any time. You don't need to have had rank advancement to be eligible unless it is noted as a prerequisite. Pick a Subject: Talk to your Scoutmaster about your interests. Read the requirements of the merit badges you think might interest you. Pick one to earn. Your Scoutmaster or Assistant Scoutmaster can give you the name of a person from a list of counselors. These counselors have special knowledge in their merit badge subjects and are interested in helping you. Scout Buddy System: You must have another person with you at each meeting with the merit badge counselor. This person can be another Scout, your parents or guardian, a brother or sister, a relative, or a friend. Call the Counselor: Get a signed merit badge application (Blue Card) from your Scoutmaster or Assistant Scoutmaster. Get in touch with the merit badge counselor and tell him or her that you want to earn the merit badge. The counselor may ask to meet you to explain what is expected of you and to start helping you meet the requirements. You should also discuss any work that you have already started. At the first meeting, you and your merit badge counselor will review and may start working on the requirements. In some cases, you may share with your counselor the work that you have already started or accomplished. Unless otherwise specified, work for a requirement can be started at any time. Ask your counselor to help you learn the things you need to know or do. You should read the merit badge pamphlet on the subject. There are many to borrow from the troop library. Show Your Stuff: When you are ready, call the counselor again to make an appointment to meet the requirements. When you go, take along the things you have made to meet the requirements. If they are too big to move, take pictures or have an adult tell in writing what you have done. The counselor will ask you to do each requirement to make sure that you know your stuff and have done or can do the things required. Get the Badge: When the counselor is satisfied that you have met each requirement, he or she will sign your application. Give the signed application to the Advancement Coordinator so that your merit badge emblem can be secured for you. Requirements: You are expected to meet the requirements as they are stated -- no more and no less. You are expected to do exactly what is stated in the requirements. If it says "show or demonstrate," that is what you must do. Just telling about it isn't enough. The same thing holds true for such words as "make," "list," "in the field," and "collect," "identify," and "label."